The cost of generating power from renewable energy sources has reached parity or dropped below the cost of fossil fuels in many parts of the world, according to a new report from the International Renewable Energy Agency (IRENA). IRENA's report, "Renewable Power Generation Costs in 2014, states that biomass, hydropower, geothermal and onshore wind are all competitive with or cheaper than coal, oil and gas-fired power stations, even without financial support and despite falling oil prices. The report was released at IRENA's annual conference in Abu Dhabi this month. Solar photovoltaic (PV) power generation is leading the cost decline, with solar PV module costs falling 75% since the end of 2009 and the cost of electricity from utility-scale solar PV falling 50% since 2010. The cost of electricity for residential solar systems by country from 2010 through 2014. In a separate report issued by Deutsche Bank this month, the cost to generate power through solar power was predicted to drop by 40% over the next three to four years. Deutsche Bank has also reported that the cost of rooftop solar power is expected to beat coal and oil-fired plant energy costs in just two years. 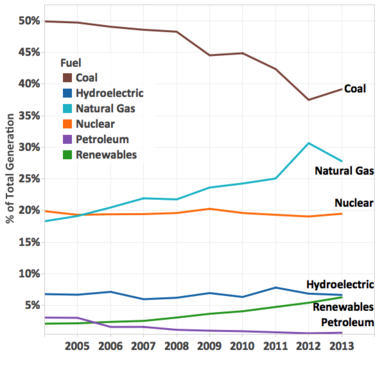 In the U.S. the amount of electricity generated through the use of renewable sources is steadily climbing. Adaba Sultan Ahmed al Jabber, the minister of state of the United Arab Emirates, said during a presentation at the conference that trend in solar costs would not be affected by plummeting oil prices. His comments were first reported by the online publication RenewEconomy. Adnan Amin, director-general of IRENA, said in a statement that renewable energy projects across the world are now matching or outperforming fossil fuels, particularly when accounting for externalities like local pollution, environmental damage and ill health. "The game has changed; the plummeting price of renewables is creating a historic opportunity to build a clean, sustainable energy system and avert catastrophic climate change in an affordable way," Amin said. Key findings in IRENA's report include the average cost for renewables, such as solar PV. Solar panel prices have dropped 75% since 2009, and those prices are expected to continue to drop. Residential solar PV systems are now as much as 70% cheaper to install than in 2008. 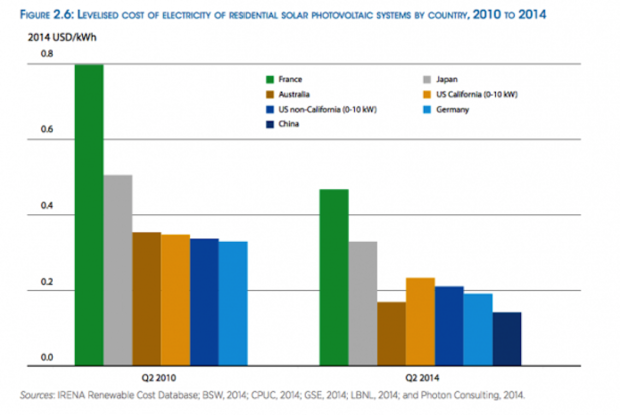 From 2010 through the end of 2014, utility-scale solar PV costs dropped as much as 65%. 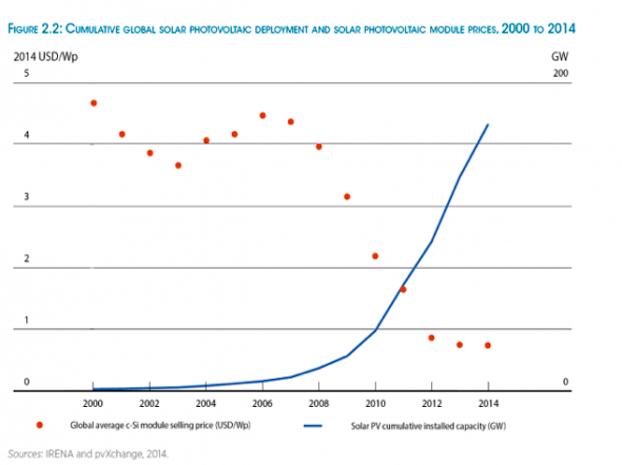 As solar deployments skyrocket, the prices plummet. The average cost of wind energy ranges from $.06 per kilowatt hour (kWh) in China and Asia to $.09/kWh in Africa. North America also has competitive wind projects, with an average cost of $.07/kWh, and some as low as $.04/kWh. The most competitive utility-scale solar PV projects are delivering electricity for $.08/kWh without financial support from governments, and lower prices are possible with inexpensive financing costs from solar providers. "It has never been cheaper to avoid dangerous climate change, create jobs, reduce fuel import bills and future-proof our energy system with renewables," Amin said. "This requires public acknowledgement of the low price of renewables, an end to subsidies for fossil fuels, and regulations and infrastructure to support the global energy transition."